Editor’s Note: The following article is an excerpt from the just-released Take Control of Your iPhone, a $15 electronic book ($10 through December) available for download from TidBits Publishing. The 195-page ebook helps readers understand what’s going on under the hood of the iPhone, with lots of tips for using the iPhone more effectively and an emphasis on troubleshooting assistance for solving problems related to activating, syncing, application crashes, iPhone freezes, handset security, and more. Have you ever tried to scroll down in a Web page and selected a link instead—with the result that you now have to tap the Back icon and wait for the page to reload? If you have experienced this, or any similar annoyance, then this section from Take Control of Your iPhone is for you. The main way you interact with your iPhone is by touching the screen. The exact ways in which you touch the screen, called gestures, determine which action is taken. Tap: Tap any active area of the touchscreen and the relevant action is taken. For example, tap any application icon on the Home screen to open that application. Double-tap: A double-tap (tapping twice quickly) has a special effect in several applications, notably Safari, Maps, Photos, Camera, Mail, YouTube and Video (in iPod). Most often, a first double-tap enlarges (zooms in on) the view and a second double-tap restores (zooms out to) the original view. One special case occurs in Maps. In Maps, a second double-tap enlarges the image further. After zooming in on a map, if you double-tap with two fingers, the display zooms out again. In all other applications, the number of fingers used for a double-tap makes no difference. Drag: Drag your finger slowly across the screen to scroll in the direction of your drag, vertically or horizontally. Flick: A flick is similar to a drag except that you move your finger faster and typically lift it off the screen at the end of the movement. This should result in faster vertical scrolling. Swipe and slide: A swipe is the same as a flick except it goes horizontally instead of vertically. You would use this, for example, to get the Delete button to appear for an e-mail message in Mail’s Inbox listings. Included in this category is the slide, which is when you move a slider to perform an action such as unlocking the iPhone after you wake it up. Pinch: A pinch is when you place two fingers on the screen and either squeeze them together (to zoom out; make smaller) or spread them apart (to zoom in; make larger). You can zoom in further by pinching than with a double-tap. Avoid flicking errors in Safari: An important principle with the iPhone is that if you touch the screen and do not lift your finger immediately, iPhone will not treat it as a tap. The converse is true as well: lift too quickly and the iPhone can think you tapped when you intended a drag or flick. For example, suppose you want to scroll a Safari Web page that contains a list of links to other pages. You intend to use a flick to scroll quickly. If you touch the screen directly over a link and lift your finger too quickly, the iPhone will treat your action as a tap rather than a flick. The result is that the link will be selected, opening a new Web page rather than scrolling the existing one. The most reliable way to avoid this problem is to hold down your finger a bit before releasing it. Or, if there is not much to scroll through, drag instead of flicking. Alternatively, if you are careful to initially place your finger on a portion of the screen where there is no Web link (or any touchscreen button), your flick cannot be misinterpreted. If you lift your finger too soon, the iPhone treats your action as a tap and opens the full e-mail message instead. If you move your finger too slowly, the iPhone interprets it as a drag rather than a swipe, and nothing happens. The solution is to practice until you have a feel for the precise speed and distance needed for your iPhone to know you swiped. If it makes you feel better, I still can’t do this successfully all the time! Perhaps Apple will improve swiping in later versions of the iPhone. Know what tapping > does in different applications: The right-pointing bracket icon (>), called the More Info icon, appears in several iPhone applications, such as in iPod’s Playlists and in Phone’s Favorites and Recents lists. Unfortunately, tapping the icon doesn’t have a consistent effect. For example, in iPod, it does the same thing as selecting the name of the playlist to its left: a list of the songs in the playlist appears. In Phone, however, tapping > brings up the full contact data for the person while tapping the name initiates a call to that person. Understand resizing restrictions: Pinching or double-tapping to resize the display may not work as expected. The most common reason is that you are already at the maximum or minimum size that the iPhone supports. Shift from portrait to landscape mode: When you turn the iPhone from a vertical orientation to a horizontal one, its display shifts from portrait (vertical) to landscape (horizontal). Text is larger when in landscape mode. Only some iPhone applications support this mode shift. Safari does. Mail attachments may also be viewed in landscape mode. iPod video is displayed in landscape mode only. Double-tap to zoom in: Double-tapping a section of a Web page enlarges it by zeroing in on the section of the page where you double-tapped. Safari attempts to limit the size so that you do not have to scroll horizontally to read a line of text. Pinch to enlarge: If you need to zoom in still further, you can usually do so by pinching out the screen. You may have to scroll horizontally back and forth to see all the text, but at least you’ll be able to read it. The same principles hold true for all iPhone’s applications. However, some options may either not be available or not be of equal effectiveness. For example, Mail does not support landscape mode for viewing e-mail text. Further, double-tapping a message often has little or no effect; pinching is the preferred method in Mail. When you navigate to or tap a location where you can enter text, such as the URL Address box in Safari or a new e-mail message in Mail, a virtual keyboard appears. There is an ongoing debate over the pros and cons of this type of keyboard. The biggest downside is the lack of tactile feedback, making it almost impossible to know what you are typing without staring at the screen. There is also more danger of unintentionally selecting an adjacent key, especially in portrait mode. Regardless, most users (including myself), are quite happy with the virtual keyboard. Personally, I prefer it to an alternative of a physical keyboard that takes up half the real estate of the phone, remaining present even when I don’t need it. Still, using the onscreen virtual keyboard effectively takes practice. Apple offers a couple of iPhone typing tutorials, including how to graduate from one-finger to two-thumb typing. Beyond such basics, in the following pages, I offer several useful suggestions. Use landscape if you can: Just as it is easier to read text in landscape mode, it is also easier to enter text in landscape mode. In Safari’s landscape mode, you get a keyboard with larger keys spaced farther apart. It is much easier to type accurately on this keyboard. Unfortunately, for the moment, Safari is the only iPhone application with a landscape keyboard. Learn your tapping bias: When I started using my iPhone, I found that I consistently misjudged the key I was going to press. I thought I was tapping directly over the key, but typed an adjacent key instead. Eventually, I found that if I tapped slightly to the left of where I had originally intended to tap, I would hit the desired key. I now do this automatically. Hold your finger down until you “see” the correct key: There is a natural tendency to press a key with a quick tap for a quick entry. Doing this, however, means that if you make a mistake, you have to press the Delete key and try again. This slows you down. If you are making many of these mistakes, press and hold down your finger on the key until the larger key icon pops up. If it is the intended key, let go; otherwise slide your finger over to the correct key and then let go. It’s slower than tapping the correct key, but it’s faster than making frequent mistakes that need to be fixed. As your typing improves, your need for this technique should lessen. Use the alphabet-to-numbers keyboard trick: To keep the keys from shrinking too far, Apple placed the letter and number keys in separate keyboards. The number keyboard also includes common punctuation marks. You shift between the two boards by tapping the Number key (@123 or . ?123, or 123 preceded by some other character, depending upon the context) in the lower left of the keyboard. If you are typing something that requires frequent shuttling between the two keyboards, this can get frustrating and time-consuming. In certain situations, you can speed up this process by pressing and holding down the Number key. Without lifting your finger from the screen, drag your finger to the actual key you want to type and then let go. The key will be entered and you will automatically be returned to the letter keyboard. For example, suppose you want to type It costs 2 dollars. When you enter 2, press and hold the Number key, slide your finger to the 2 key, and let go. The 2 is entered, but the keyboard reverts to the letter display, allowing you to continue immediately with d for dollars. Had you let go of the Number key, you would have had to go back and press it again, after typing 2, in order to return to the letter display. Enter international characters: When entering text on your iPhone, do you ever want to use international (that is, non-English) characters, such as an é or an ñ? If so, here’s how to do it: From the virtual keyboard, press and hold down the letter to which you want to add a diacritical mark. After a second or so, a popup strip appears, listing all supported variants of that letter. Slide your finger to select the variant you want and let go. If no strip appears, it means there are no supported variants for that letter. On the Settings -> General -> Keyboard screen, you can control whether double-tapping the Spacebar on the virtual keyboard inserts two spaces, or if it inserts a period and a space. Use the Spacebar double-tap: In version 1.1.1 or later of the iPhone software, if you double-tap the Spacebar, you insert a period followed by a space. This is a quick way to add a period at the end of a sentence and get ready to start the next sentence. It’s especially useful because the default iPhone keyboard doesn’t have a period button directly accessible. Instead, you must tap the Number key (e.g., . ?123) and then tap the period key. You can turn this option On or Off via the “.” Shortcut option in Settings -> General -> Keyboard. 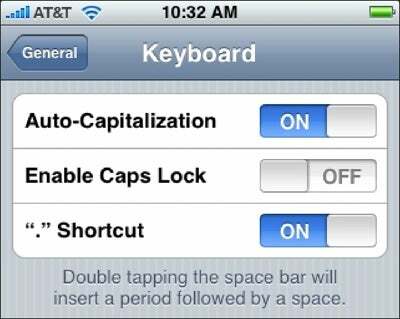 Auto-Capitalization: When Auto-Capitalization is enabled, the iPhone automatically capitalizes letters that it believes should be capitalized (such as the first letter at the start of a sentence). While this can save you some time by letting you skip a tap of the Shift key, I prefer to keep this option off. Otherwise, I find it too often capitalizes words that I want to leave as lower case. Enabled Caps Lock: With Enabled Caps Lock turned on, a double-tap of the Shift key on the keyboard enables Caps Lock. As with standard computer keyboards, this means that all subsequently typed letters are capitalized until you press Shift again. This option is a definite time saver with virtually no downside. To accept a suggestion, press the Spacebar (or press the Return key or enter a punctuation mark, such as a period). To reject a suggestion, either continue typing or tap the x icon to the right of the suggestion.